It can ruin the aesthetics by leaving brown patches. Lowering the cutting height is a process that takes time. 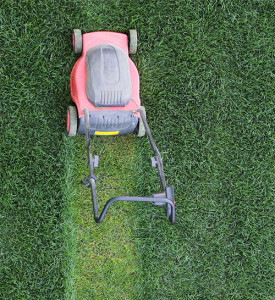 If a lawn becomes too thick it’s best to mow more regularly and remove all the clippings. 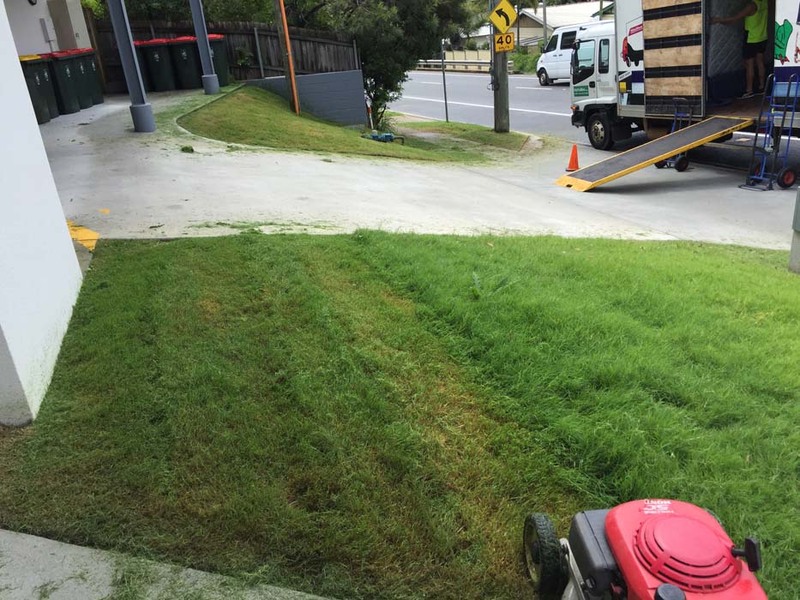 Start by setting the blade’s high and mow over it once, after this lower them and mow it again, however make sure the blades are still moving easily.On average lawns around Brisbane should be left 40-50mm in height depending on the type of turf. Establishing boundaries between the lawn and paths or driveways. To taper a lawn it is essential to angle the whipper snipper slightly towards the wall, start with the cord about 10cm away from the wall andkeeping it on the angle move it towards the wall cutting on the way in. Repeat this process as even as possible the whole way along the obstacle, this will taper the lawn down to the edge, as the name suggests. 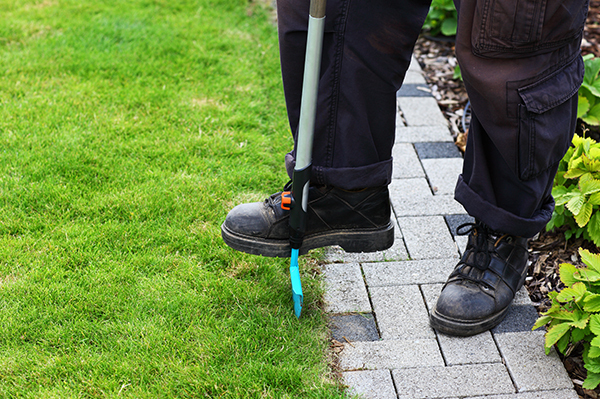 Establishing boundaries between a lawn and a path requires another step after tapering. When tapering for a driveway or path it’s not necessary to use as much angle on the whipper snipper as you would for a wall, just make sure the edge is the same height as the rest of the grass. After tapering, turn the whipper snipper upside down leaving the cord at a right angle to the path, trying to keep the edge as straight as possible establish a 10-20mm gap between the lawn and the path. Mowing the lawn in strips is the best way to keep it all at one height with a neat and tidy finish. Start by mowing around the boarder of the yard so there are no patches left at the end of each strip mowed. If the yard is on a hill it is still advisable to mow around the boarder to establish that buffer zone. There are self-propelled mowers on the market which have accelerators and move automatically, which make mowing uphill easy. 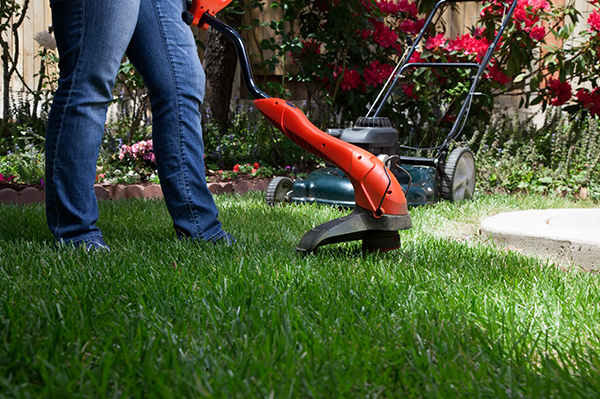 By regularly servicing a lawn mower and keeping the blades sharp it allows for a better cut. When the blades on the mower aren’t working properly they grip the grass and rip it out rather than cutting the clippings off the top. 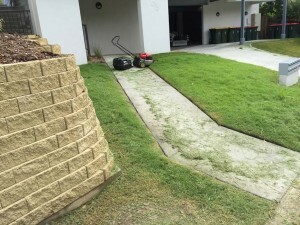 Ripping the grass damages the root structure, depleting the grass of nutrients and potentially leaving dead patches in the lawn or allowing weeds to invade. There are a number of different types of mowers and blades on the market, some can be sharpened and others will need to be interchanged when they go blunt. This is an issue worth bringing up with your local lawn mower dealer. 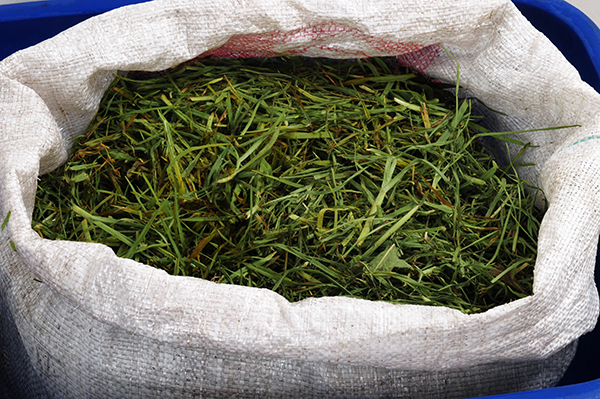 Lawn clippings are full of essential nutrients which can be recycled and used to feed the turf naturally and can save paying fees at the tip. 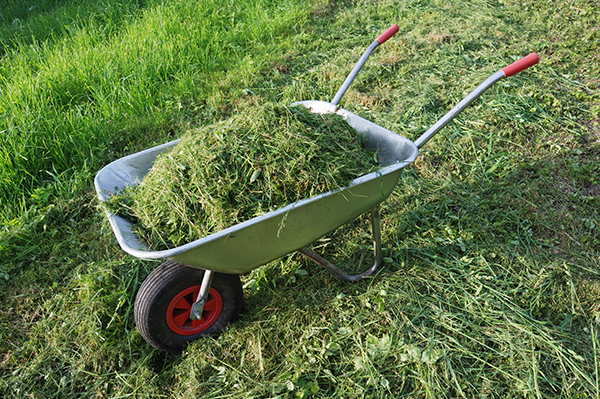 Using a self-mulching lawn mower is the most efficient way of recycling clippings back into the lawn. If there is no self-mulcher on the lawn mower and the plan is to use the mower without a catcher, it is essential run over the clippings a few times. 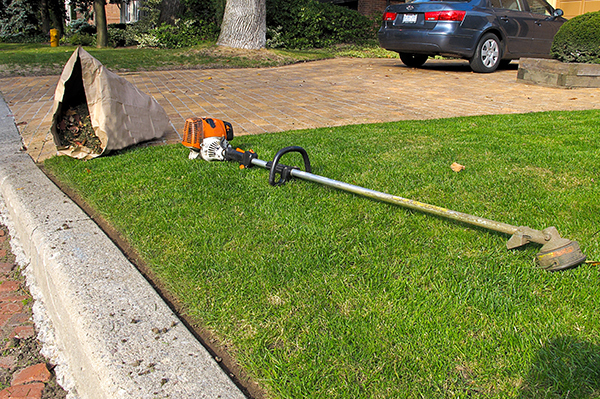 Lawn clippings need to be as small as possible to be effective as mulch. However there are still some lawns where it’s best to take the clippings away. Using the clippings for mulch thickens the lawn, so if a lawn is already too thick then it’s a good idea catch the clippings and take them away. Overgrown lawns also need the clippings taken away because the long grass becomes too coarse to break down effectively.